Alcantara Gorge by Ania Mendrek. Licensed under CC BY-ND 2.0. Thousands of years ago a battle between two forces of nature collided and after all the dust was settled, a beautiful majestic place was created and it is the jewel of Sicily, the Alcantara Gorge. Hot molten lava from Mount Etna flowed down the mountain destroying everything in its path until it reached a second force of nature water from the Alcantara River. This caused the lava to cool and harden, but the water was able to create a fracture in the lava creating the gorge. Over time, the water has carved through the basaltic walls creating this natural beauty. The Alcantara Gorge is located just 20km west of the town of Taormina, Sicily. At one time, this area was off limits due to the dangers of climbing down to the gorge. Fortunately, for everyone the Alcantara River Park (Parco Fluviale dell'Alcantara) was created to protect this area and make it accessible. You can enjoy the beauty this area has to offer by walking the various trails, which include balconies giving different views of the waterfalls, lava walls, valley, flora and fauna. As you make your way down to the bottom, you will have access to a beach area. Just know that the water is ice cold, so when you step in be prepared for the exhilarating experience. Give yourself plenty of time to enjoy all this area has to offer. 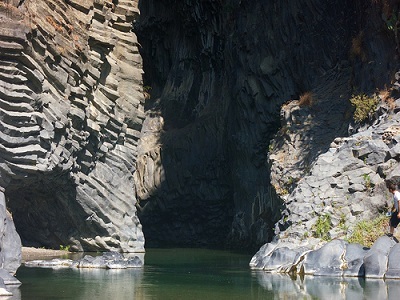 For the more adventurous tourist, river guides will take you on a body-rafting excursion through the canyon. There is a fee for this activity and they will provide you with the necessary equipment. There is a free public entrance and a paid entrance. If you do not have any physical conditions that would prevent you from walking down steps and back up them then you may want to take the free public entrance. Just keep in mind that the steps can be steep. The free entrance is located about 100 meters passed the main entrance. If physical conditions are an issue then use the paid entrance. They do offer a lift that will take you up and down the canyon. The paid entrance will also give you access to the botanical gardens, museum and other features. Which entrance you choose is all up to you. If you enjoy Roman mythology these waters were frequented by the goddess Venus. As the legend goes the god Vulcan made this a sacred place for his love Venus, so the goddess could always bathe in the warm water. Unfortunately, Venus betrayed Vulcan and he took his rage and made the waters of the Alcantara River ice cold so she could no longer enjoy her favorite spot. If you believe in legends it also states that any man who bathes in these waters will regain his virility and the woman her virginity. Perhaps this is why it is a popular place for people to visit.